One Unsolved Mystery Some Clues = Gripping Suspense Excitement! Jess McColl had been looking forward to the first clowning practice of the Twelve Candles Club, but when the other club members arrived she was happy for another reason. She'd been home alone and was sure she'd heard noises. 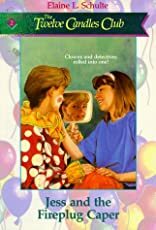 Just the sight of her wacko friends dressed in their clown outfits helped shake away the strange feeling of uneasiness that had settled over her room. Hoping to become an Olympic gymnast, Jess will provide the Twelve Candles Club with the cartwheels and backflips to make their clowning business a hit with the children they entertain. Her clown name of "Fireplug" promises to be an understatement. But a loud clanging noise in the back yard, weird phone calls, and the car alarm going off on Jess's mother's Mercedes lead to an unwanted mystery that Jess can't seem to escape. Is everything that's happening just a coincidence? What is the intruder really after? Best Friends Stick Together Even When Their Knees Are Knocking!